Today in Masonic History Thomas Elliott Bramlette is born in 1817. Thomas Elliott Bramlette was an American politician. Bramlette was born on January 3rd, 1817 in Elliott's Cross Roads in Cumberland County, Kentucky. He studied law and was admitted to the bar in 1837 at the age of 20. He began practicing law in Louisville, Kentucky. In 1841, Bramlette began his political career when he was elected to the Kentucky General Assembly representing Cumberland County. 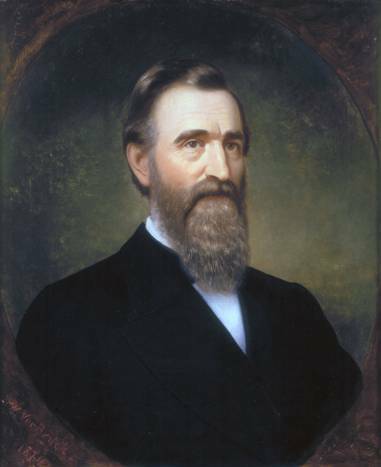 In 1848, he was appointed as the Commonwealth's Attorney for Kentucky. He resigned two years later to return to private practice. In 1852 he relocated his practice to Columbia, Kentucky. The following year he ran for the United States House of Representatives and was defeated. In 1856 he was elected as judge in Kentucky's 6th Judicial District. He served until 1861. In 1861, after resigning his judgeship, Bramlette enlisted in the Union Army. In violation of Kentucky's agreement to remain neutral in the Civil War, Bramlette raised and commanded the 3rd Kentucky Infantry. In 1862, Bramlette resigned his commission to accept an appointment from President Abraham Lincoln as the United States District Attorney for Kentucky. During his time in office he vigorously enforced Kentucky's wartime laws against Confederates and Confederate sympathizers. In 1862, Bramlette was the Democratic nominee for Governor. Union forces in the state harassed and in some cases jailed supports of Bramlette's opponent essentially guaranteeing Bramlette the election. Bramlette addressed the Kentucky General Assembly on January 4th of 1863 where he informed them that Kentucky had fulfilled it's quota of soldiers for the Union Army. He also proclaimed that that rebel sympathizers would be held responsible for all guerrilla raids in the state. Those caught aiding the guerrillas would suffer stiff fines and imprisonment. In the beginning of his term, Bramlette was a staunch supporter of the Union, within the first year of his term his stance had changed. This was due to several specific reasons. The first of which was that Abraham Lincoln had suspended habeas corpus in Kentucky, which put the state under martial law. Bramlette was also opposed to the recruitment of African-Americans into the military. It was promised to Bramlette that African-Americans would not be brought into the military unless Kentucky failed to meet it's quota. The Union Army in Kentucky also continued it's harassment of voters in the 1864 Presidential election. After all of this Bramlette declared that he would "bloodily baptize the state into the Confederacy." This never happened. In 1865, Bramlette, despite his concerns about the behavior of the Union Army in Kentucky, urged the General Assembly to ratify the Thirteenth Amendment abolishing slavery. Bramlette stated that slavery was "irrevocably doomed." During the reconstruction era, it took until President Andrew Johnson came to office before habeas corpus was restored in Kentucky and martial law. Even then it took Kentucky giving the majority of it's congressional seats to Democrats and Bramlette declaring that only "white males" over the age of 21 and had resided in the state for two years were permitted to vote. Bramlette also opposed the Fourteenth and Fifteenth amendments which are also referred to the Reconstruction amendments. The Fourteenth which provides equal protections under the law and the Fifteenth prevents any state or federal government from preventing someone from voting based on "race, color or previous condition of servitude." Bramlette also opposed the creation of the Freedmen's Bureau, a federal organization to help freed slaves, in the state of Kentucky. Bramlette passed away on January 12th, 1875. Bramlette was a member of Albany Lodge No. 260 in Albany, Kentucky.